1 There are two steps in preparing this dish. First, let’s begin by making the chicken poppers. Have 3 sets of bowls or trays filled each with flour, egg and breadcrumbs ready. Now, you’ve got to coat the chicken in flour, then dip it in the beaten egg before finally rolling them in breadcrumbs. Did you know that you can store the breaded chicken or make this ahead? Or you may immediately fry them in very hot oil until the chicken is cooked through. 2 For the second step, let’s make the sauce. Get your pan nice and hot and bring this to medium heat. Pour some oil and throw in the onion and garlic and cook this until the onion is translucent and the garlic is golden in color. Now, pour the water in, then the soy sauce, vinegar, and Knorr Complete Recipe Mix Ginataang Gulay. Bring this to a simmer for at least 2-5 minutes or until the mixture is free of lumps. Finally, season this well with pepper and chopped green siling haba. 3 A little creativity goes a long way. 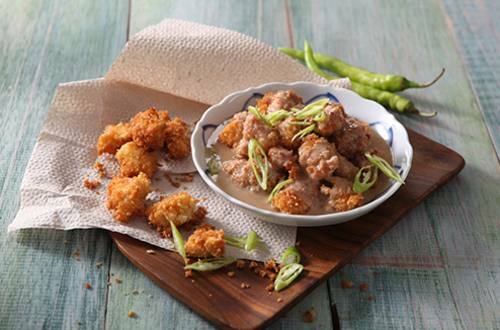 Chicken Poppers with Adobo Gata Sauce is simply heaven with every bite! The kids are going to go nuts over this recipe.